"My time at Plymouth built my confidence, having confidence helps me deal with challenges." 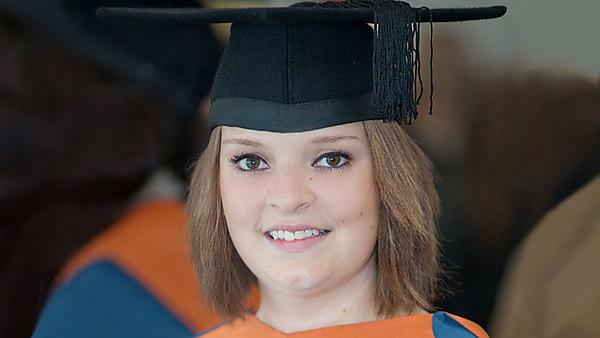 April Watkins recovered from a brain tumour in her first year of study to secure a 2:1 in BSc (Hons) Sociology in 2013. Since graduating, she has joined Blind Veterans UK in Brighton, working as an Activity Facilitator. "I chose Plymouth because of the location and the fact it was a campus university. I had a great time at university and the location and campus style university definitely had an impact on this. "Studying at Plymouth allowed me to gain the skills I needed to be able to navigate a very challenging and competitive world. The experiences I went through whilst at University guided me into the care sector." "I completed a month’s placement at Working Links, this experience highlighted to me that I wanted to work directly with people helping make a positive difference to their lives. Since completing my degree, I have worked with adults with learning difficulties and mental health issues and currently work with blind veterans." "As the headaches became worse, I saw a total of 11 medical professionals, including GPs, A&E doctors and opticians, who diagnosed me with a variety of things, such as sinus problems. "After a long wait and fed up with no-one taking me seriously, I rang Derriford Hospital in Plymouth and begged for help. I was given an emergency MRI scan that revealed I had a brain tumour. Straight away I had an operation to insert a shunt into my brain to drain the fluid which had been causing the pressure and excruciating pain. Then came a seven-and-a-half-hour craniotomy to remove the tumour. "The news that it was cancerous – a grade 4 medulloblastoma – was devastating, and I was shocked to learn that without the surgery at that time, I would have died. "To give me the best chance of beating the cancer, I immediately underwent six bouts of chemotherapy – one cycle every two weeks, followed by radiotherapy twice a day for five weeks and then a year of maintenance chemo. The chemo made me feel very anxious and it was tough losing my hair. I also had to miss the whole second term of my studies, so I don’t know what I’d have done without the love and support of my family and friends." "It was during the chemo and radiotherapy that my dear mum passed away. This was such an awful time, particularly as my illness had robbed me of the chance to spend much time with her. After she died, my health deteriorated, although thankfully I did make it to her funeral. "It was just a couple of months later that things finally looked up and a scan showed no trace of the tumour. I was elated, and all my subsequent scans have been clear. I was able to complete my studies, and was really proud to graduate in 2013. "Since my diagnosis I’ve met many people with brain tumours who’ve sadly since died or had awful side effects, such as loss of mobility and blindness, and I realise just how fortunate I have been. This is why I am supporting Brain Tumour Research. It’s brilliant that the charity is working in partnership with my own University and I want to help them raise awareness and the funds so urgently needed for further research. I want everyone to get behind this because research is the key, and it needs to happen now. "I have become a young ambassador for The Brain Tumour Charity and regularly share my story of my diagnosis at charity events to raise awareness for the cause. I have recently won an award for going above and beyond in my role and was invited to an award ceremony and presented at it. As a young ambassador for The Brain Tumour Charity I went to Brussels where I represented the charity at the European Parliament by talking about my own diagnosis and relating it to the charities main aims and manifesto initiatives." Brain Tumour Research is an official charity partner of the University. We're one of only four universities in the UK working with the charity to improve the treatment and outcomes of brain tumours. "I had outstanding support from the Clyro service at the University - they would help me with proofreading and planning, provided me with a laptop, a dictaphone and I was assigned my own personal tutor to help me juggle university and getting better. I wouldn’t have been able to achieve what I did without them. I also received some financial support from the University in the form of a grant which helped immensely. It’s fantastic that my University has been chosen to partner with Brain Tumour Research. I have been incredibly fortunate in my recovery but there are so many others who sadly do not survive and more research is desperately needed." The What Just Happened Fund provides help for you and your family if you're receiving emergency hospital care. It was established in 2013, thanks to April, and matched funding from the University. The fund provides limited financial support for you – and/or your close family or friends – for costs incurred at short notice if you unexpectedly require treatment for a serious injury or illness while you're studying at the University. The financial help available can be used towards the cost of travel, accommodation, and food and drink during the stay. April had the idea for the fund while recovering from emergency surgery and chemotherapy. Fortunately, her father was able to stay with family in Cornwall while visiting her in hospital, but the situation got April thinking about those whose families might struggle to afford the costs of visiting their loved one. Determined to make a difference, April set about fundraising through events such as masked balls, pub quizzes and cake sales, and was overwhelmed by the level of support she received.